Formula 4-Stroke Synthetic 10W-40 Scooter Oil Outstanding Protection for Scooter Engines, Transmissions and Gearboxes Meets the needs of today's high-tech air- and water-cooled four-stroke motorized scooters. Unsurpassed wear protection and friction reduction for longer equipment life. Protects transmissions and gear boxes. Wet-clutch compatible to insure smooth clutch operation. Provides long-term protection during storage. Scooters are often subjected to extended periods of inactivity and storage, exposing the equipment to internal rust and corrosion. 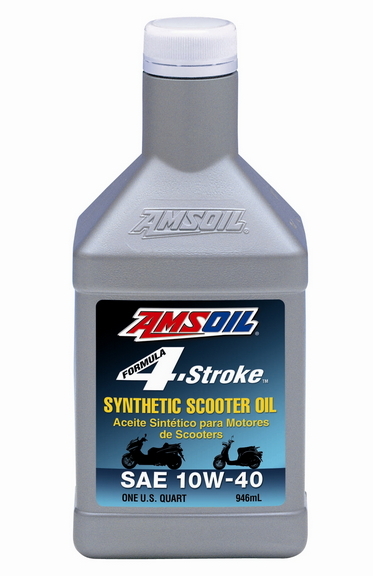 Formula 4-Stroke Synthetic 10w-40 scooter oil is formulated with a special anti-corrosion additive package designed to provide long-term protection during periods of inactivity and storage.